Channtelya Owens had a lot to celebrate at this year’s End of Year Ceremony for YWCA New Britain’s Family Literacy Center. Despite recently experiencing homelessness and being a single mother, Channtelya was able to complete her GED and graduate with the help of the Family Literacy program. Channtelya is like many of our students, with extenuating circumstances preventing them from completing their high school education in a traditional way. The YWCA’s Family Literacy program gives them an alternative way to earn their degree. The program is the only Adult Education Center in New Britain developed to meet the needs of women and their young children. In 2009 the Family Literacy program had just 20 students participating in GED and ESL classes. This number has grown to over 70 students in this year’s class. “Thankfully I found this program and met all these wonderful people and wonderful teachers. I was lucky enough to have childcare while I was studying here. When I first came here I was really shy. I was scared. But with the help of Ms. Candace and Ms. Velmar and Ms. Betsy, I’ve come a long way,” said Channtelya. During the 2017-2018 school year, two students graduated, three students passed their U.S. citizenship tests, and many students dedicated themselves to learning and completed over 100 hours of study. At the ceremony, awards were given to students who advanced a level in their learning or reached hours of study milestones, to dedicated volunteers, and to children in the play and learn program. Students posed for pictures with their teachers upon receiving their certificates, and children received several books to read over the summer. “We are very proud of our students this year. It’s clear they have worked hard. We are also grateful for the partnership with Literacy Volunteers and New Britain Adult Education. 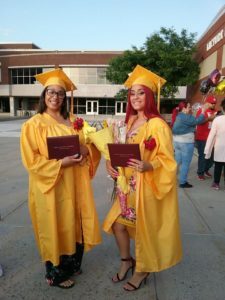 The combination of resources brought to the program by all of the partnering agencies really is what makes this program so successful,” said Tracey Madden-Hennessey, Associate Director of YWCA New Britain. Many volunteers and tutors were recognized for their outstanding dedication to the students and their children. Some helped with childcare while mothers were busy learning and others helped guide students to obtain their GED or work through tough English grammar lessons. We’d like to thank the following volunteers from the Family Literacy program: Pat Nelson, Sara Frey, Sue Deguzis, Shari Guarino, Betsy Waller, Elizabeth Cain, Christene Wrobel, Dwayne Jordan, Lilly Rodriguez, Kyle Gonzalez, Aparna Nibandhi, Rose Lamprea, Jessica Fitzgibbon, Destiny Little, Lelania Lebrun, Clara Drozdowski, and Maricelis Abreu. Congratulations to Christine Santos and Channtelya Owens for graduating this year, and to all our students for their hard work and success!